Last week I brought up one of Finland’s biggest surprises of 2011 and since there is an extremely viable companion to tack into the same league, let us get cracking with Nerve End, a very crafty band from my university town of Joensuu. 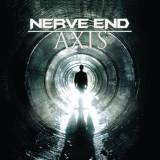 Out of the masses of metal that I’ve consumed this year, Nerve End’s Axis EP is definitely one of the most original sounding packages of them all, made especially impressive by the young phase of the band (formed together in 2007, one official EP release, named This State Of War, prior to this new one). At first one feels the heavy rhythmic vibes of bands like Meshuggah. I believe nowadays the kids would refer to the styling as “djent” or so. Not so much of the typical palm-muted action going on but the proggy moments are clearly reflected in the pacing as well as the sometimes tricky song structures. On top of this, you’ve got huge washes of layered vocals and intricate keyboards that bring in a very definite taste of Devin Townsend’s “solo” material. Melodically and in terms of some quirky riffage and lead guitar licks one can also feel the influence of Stam1na, one of our homeland’s finest current product. But on top of all this, there is some nameless element, maybe the one of mixing the prog and trickery with straightforward catchiness and subtle atmospherics, which give the concoction a very fresh feel. In terms of single tunes, the group is in fine form as well. Venom Willow feels like a very apt opening track that introduces one to Nerve End’s take on modern metal. Great harmonizing work with both the vocals and guitars. Very infectious chorus that firmly latches onto your left and/or right cerebellum. Nifty guitar solo that lays down the band’s seeming philosophy of using details to serve the tune instead of moments of pure technical flash. The Squid opens up with a more ominous and sinister volume of riff work from both the guitar and keyboards. A slight shame that the whole tune doesn’t quite keep up with its great opening salvo, although the guitar solo is again very tasty. And I must emphasise that in the context of this 4-tune collection, it’s moreso a case of one “just good” song lodged between three great ones. Take the record closer Thrive for example that mixes mellow melodies with some furious double bass drum workouts and off-kilter verse beats. Probably my favourite tune thus far of this set. Singer/guitarist Joonas Kaselius displays a very capable set of pipes switching between a more intense shout and the aforementioned layers of melodic clean vox. His skills are readily matched by the rhythm section’s virtuosic spurts that never go out of bounds. Oh, and the production job on this baby? If I heard this without prior knowledge about the self-financed and self-produced factors being involved, I’d tell you to take a hike. Amazing what soundscapes independent resources can lead to these days. All in all, I guess the only “bad” thing about this release that it is only four songs long, dammit! Moar! Now! Although naturally such hunger is also a good sign. If we had a full LP of material on par with this quality throughout, we’d be easily knocking on the doors of a 90-score or so. Remember the name Nerve End, people. If these guys remain breathing and equally inspired, I see no way that they’re not heading for high places. Don’t believe me? Then head over to their website from above to either listen to or download this whole batch for free. Oohhh yeah.